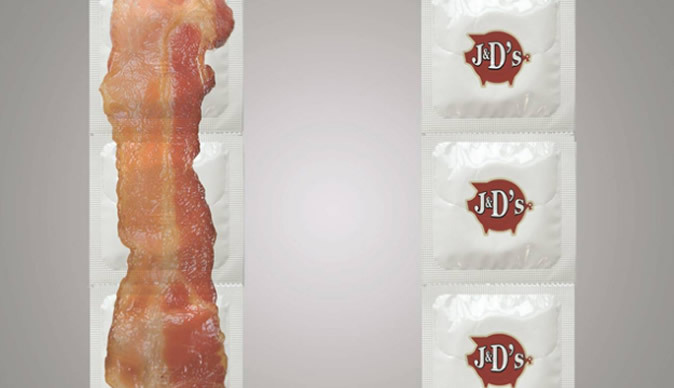 J & D's Foods has decided to follow up its successful bacon lubricant with bacon flavoured condom. The Seattle based company is apparently serious this time round despite the lubricant having been intended as a previous April Fool's joke. The condoms come with the tagline 'make your meat look like meat' and will be coated in water-based lube. One half of J & D's Foods, Justin Esch, told The Huffington Post the success of bacon lubricant, which was eventually sold after its comic beginnings, encouraged him to launch the new condom line. He added the new pork inspired contraceptives would smell like bacon but will be latex like normal ones. 'There's no injection mold or anything,' he said.